Let’s use area diagrams to find products. For each of the following products, choose the best estimate of its value. Be prepared to explain your reasoning. Here are three ways of finding the area of a rectangle that is 24 units by 13 units. What do the diagrams have in common? How are they alike? If you were to find the area of a rectangle that is 37 units by 19 units, which of the three ways of decomposing the rectangle would you use? Why? 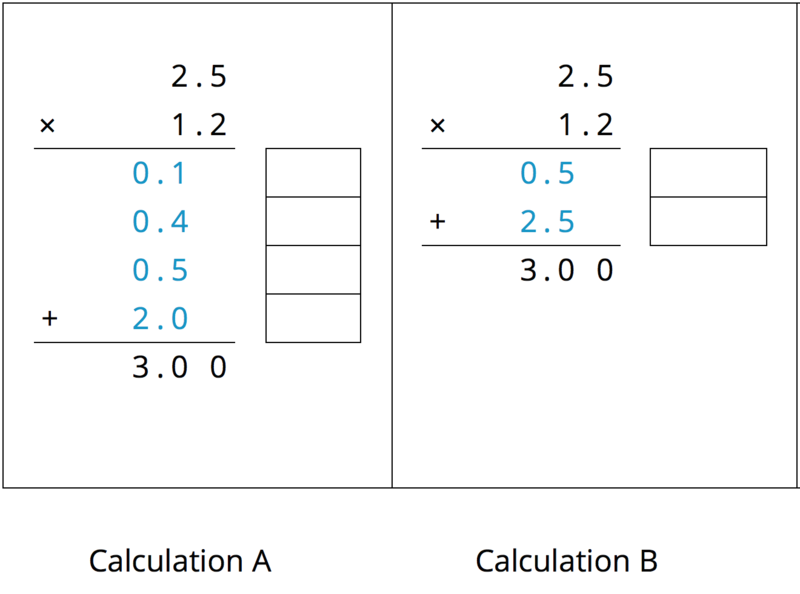 You may be familiar with different ways to write multiplication calculations. 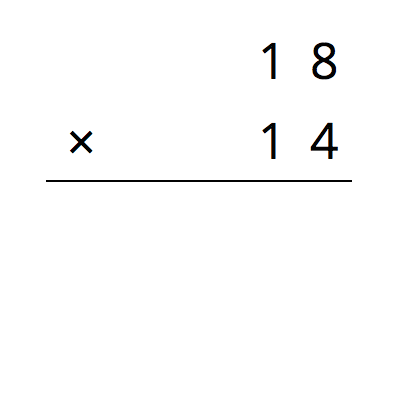 Here are two ways to calculate 24 times 13. 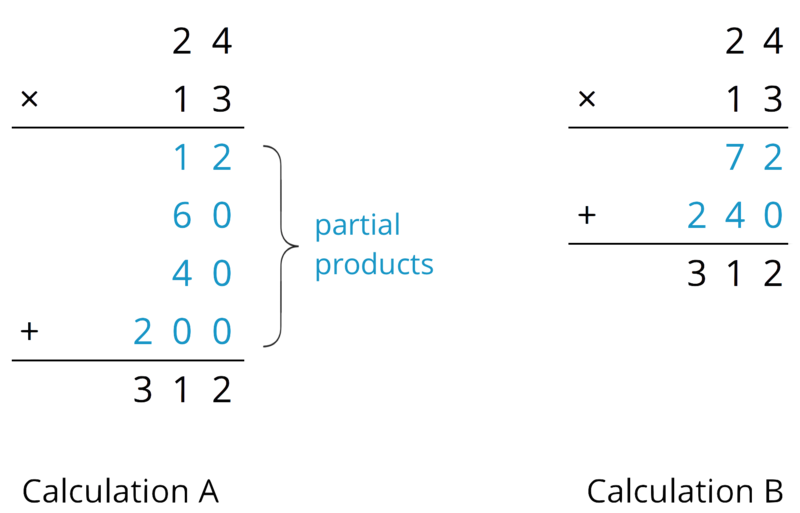 In Calculation A, how are each of the partial products obtained? For instance, where does the 12 come from? In Calculation B, how are the 72 and 240 obtained? Look at the diagrams in the first question. Which diagram corresponds to Calculation A? Which one corresponds to Calculation B? How are the partial products in Calculation A and the 72 and 240 in Calculation B related to the numbers in the diagrams? Use the two following methods to find the product of 18 and 14, then compare the values obtained. Here is a rectangle that is 18 units by 14 units. Find its area, in square units by decomposing it. Show your reasoning. Compare the values of $18 \boldcdot 14$ that you obtained using the two methods. If they are not the same, check your work. Use the applet to verify your answers and explore your own scenarios. In order to adjust the values, move the dots on the ends of the segments. You can use area diagrams to represent products of decimals. 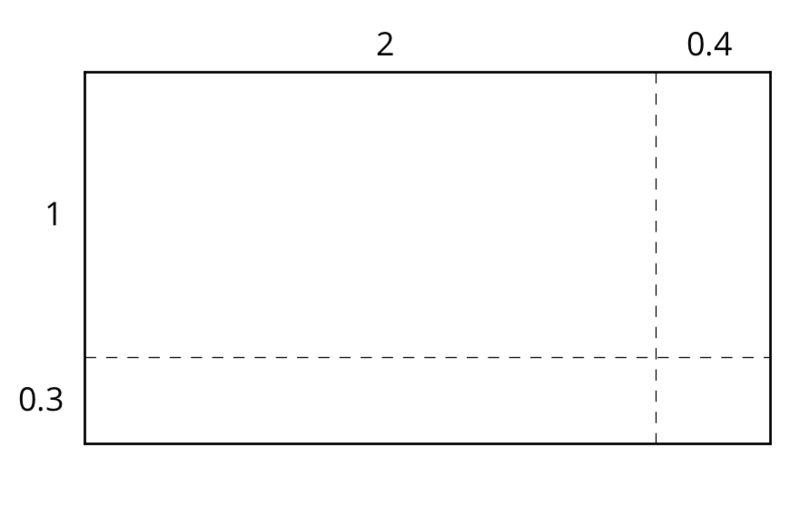 This area diagram represents $(2.4) \boldcdot (1.3)$. Which region represents $(0.4) \boldcdot (0.3)$? 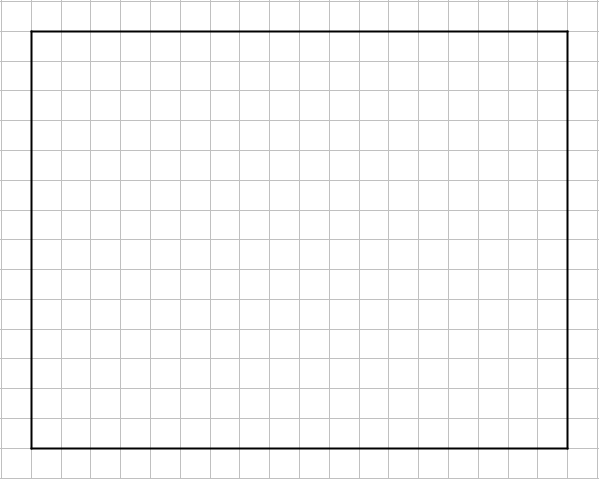 Label that region with its area of 0.12. Label each of the other regions with their respective areas. Find the value of $(2.4) \boldcdot (1.3)$. Show your reasoning. Here are two ways of calculating 2.4 times 1.3. Which two numbers are being multiplied to get 0.12 in Calculation A? Which numbers are being multiplied to get 0.72 in Calculation B? How are the other numbers in blue calculated? In each calculation, why are the numbers in blue lined up vertically the way they are? Find the product of $(3.1) \boldcdot (1.5)$ by drawing and labeling an area diagram. Show your reasoning. Show how to calculate $(3.1) \boldcdot (1.5)$ using numbers without a diagram. Be prepared to explain your reasoning. If you are stuck, use the examples in a previous question to help you. How many hectares is the property of your school? How many morgens is that? Label the area diagram to represent $(2.5) \boldcdot (1.2)$ and to find that product. Decompose each number into its base-ten units (ones, tenths, etc.) and write them in the boxes on each side of the rectangle. Label Regions A, B, C, and D with their areas. Show your reasoning. Find the product that the area diagram represents. Show your reasoning. Here are two ways to calculate $(2.5) \boldcdot (1.2)$. 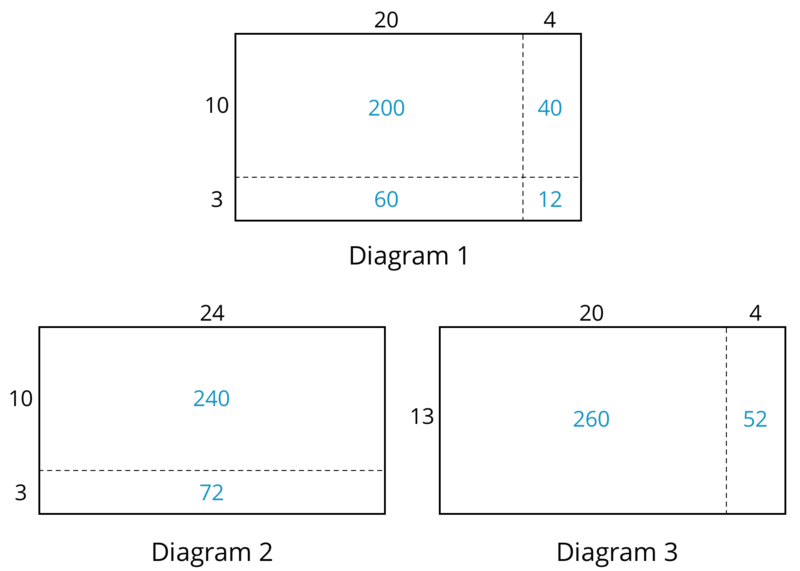 Each number with a box gives the area of one or more regions in the area diagram. In the boxes next to each number, write the letter(s) of the corresponding region(s). In Calculation B, which two numbers are being multiplied to obtain 0.5? Which two are being multiplied to obtain 2.5? Suppose that we want to calculate the product of two numbers that are written in base ten. To explain how, we can use what we know about base-ten numbers and areas of rectangles. 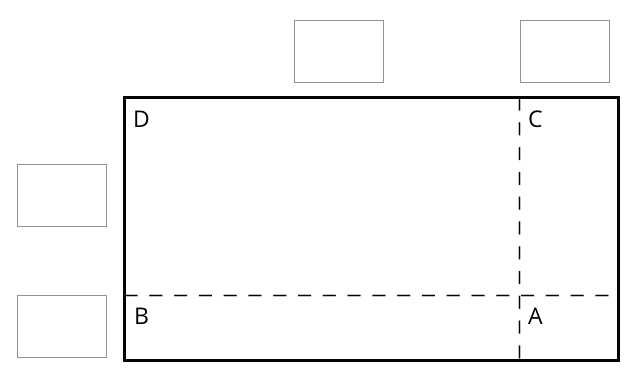 $(3.4) \boldcdot (1.2)$. To calculate this product and find the area of the rectangle, we can decompose each side length into its base-ten units, $3.4 = 3 + 0.4$ and $1.2= 1 + 0.2$, decomposing the rectangle into four smaller sub-rectangles. 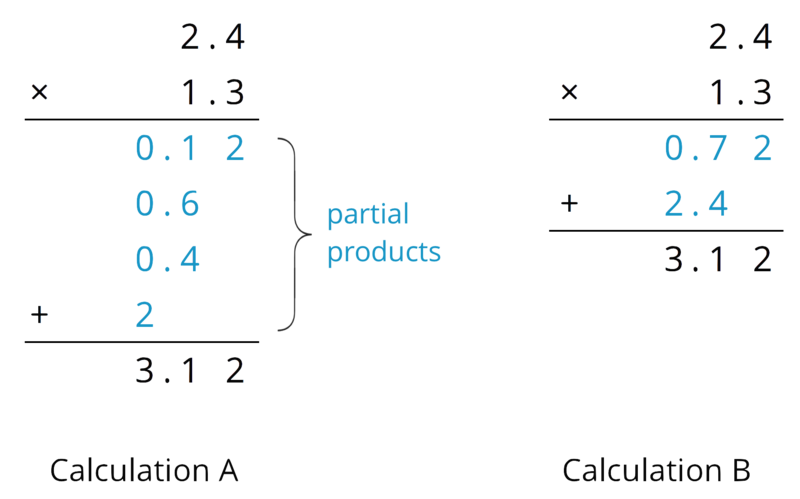 In the last expression, each of the four terms is called a partial product. Each partial product gives the area of a sub-rectangle in the diagram. The sum of the four partial products gives the area of the entire rectangle. We can show the horizontal calculations above as two vertical calculations. A is 0.2 unit by 0.4 unit, so its area is 0.08 square unit. B is 3 unit by 0.2 unit, so its area is 0.6 square unit. C is 0.4 unit by 1 unit, so its area is 0.4 square unit. D is 3 units by 1 unit, so its area is 3 square units. The sum of the partial products is $0.08 + 0.6 +0.4+ 3$, so the area of the rectangle is 4.08 square units. The combined regions of A and B have an area of 0.68 square units; 0.68 is the value of $(3 + 0.4) \boldcdot 0.2$. The combined regions of C and D have an area of 3.4 square units; 3.4 is the value of $(3 + 0.4) \boldcdot 1$. The sum of the values of two products is $0.68 + 3.4$, so the area of the rectangle is 4.08 square units.